of the fuel discharged into the airstream passing through the venturi. of this carburetor model. This transparent fuel bowl greatly simplifies trouble shooting and carburetor servicing. in a single, easily replaceable assembly. been replaced by neoprene diaphragms to insure more positive action and increased service life. 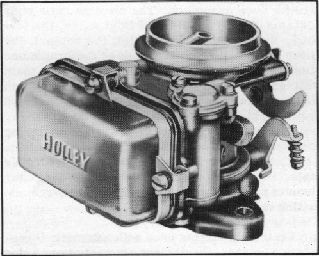 dependable performance, characteristic of all Holley products, which is delivered by this carburetor. ing lasting, effective, and dependable service. contains most of the fuel metering elements and passages. excellent hot operation and anti-percolation qualities.